A vocal competition in Cedar Rapids this weekend will feature what’s being called barbershop quartets — for women. The Mid-America Region of Sweet Adelines International is bringing about 600 singers to the three-day contest. One of the organizers, Rhonda Puntney of Burlington, Wisconsin, has sung in her chorus 12 years. Pentney says the competitors are coming from across the region — from within Iowa and as far away as Michigan. “We have 15 quartets competing Friday evening and 13 choruses competing Saturday afternoon,” Puntney says. “The quartets are just four women standing on stage singing and the choruses range anywhere in size from about 20 people to 60 or 70.” The contest will feature granddaughters singing along side grandmothers, with ages ranging from 12 to 80. The quartet winners from this regional competition will compete in Seattle, Washington, in October, while the chorus winners will compete at the 2011 International competition in Houston, Texas. “It’s barbershop singing for women — that’s what Sweet Adelines is all about,” Puntney says. “We have four parts, it’s tenor, lead, baratone and bass. 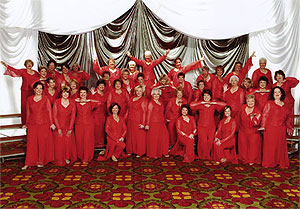 The arrangements are a little bit different that what the men’s are but the voice structure is essentially the same.” Sweet Adelines International is a worldwide organization of women singers committed to advancing the musical art form of four-part a cappella harmony through education and performance. Contestants will be judged in four categories: music, sound, showmanship and expression. The competition runs Friday through Sunday at the Cedar Rapids Marriott, with a mass sing on Saturday night from every balcony in the atrium. To hear more, visit: “www.sweetadelineintl.org“.